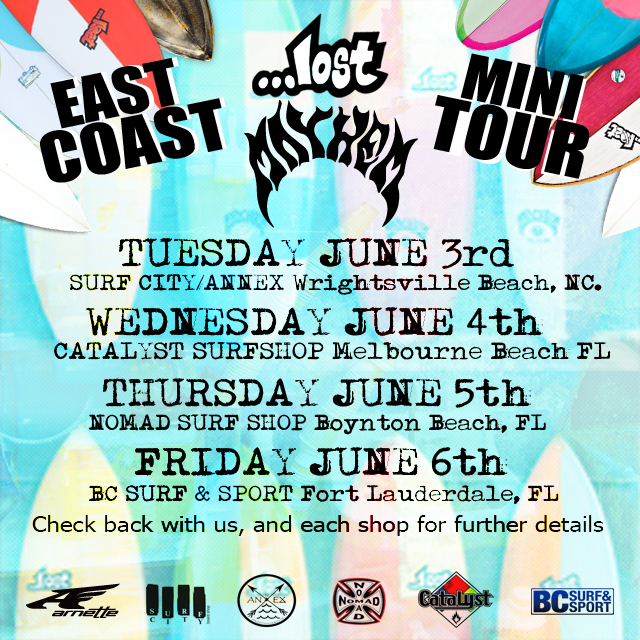 The …Lost/Arnette East Coast Mini-Tour will take place June 3rd-6th. We will be at Surf City June 3rd, Catalyst Melbourne Beach June 4th, Nomad Surf Shop June 5th and BC Surf June 6th. Talk with …Lost co-founder and shaper Matt “Mayhem” Biolos about surfboard design, tech and function. CAD design your next board one on one with Matt. Every new …Lost boards sold (stock or custom) gets $100.00 off and a pair of …Lost boardshorts. If we dangle a big enough carrot Chris Ward could possibly show up too. Pick his brain on last minute plane flight options, Brazilian taxi rides and how other team riders boards work. Plenty of ResinWorks and team boards on display. We’re also dragging along Rock-N-Roll board builders Tunnel Vision to perform live at all the venues. Best of all: free …Lost gear for all the groms (also while supplies last). More details to come… Stay tuned.